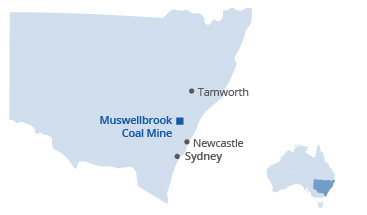 Muswellbrook Coal Mine operates in accordance with a series of comprehensive management plans. These comprehensive plans define objectives and processes for day-to-day operations, environmental management and reporting, and cultural heritage. These plans are approved by Council, with input from other regulators as required. Data prior to 2015 is not available on the website. If you want access to this data please call us on 02 6542 2300 or email us on muswellbrookcoal@idemitsu.com.au. Annual Environmental Management Reports prior to 2013 are not available on the website. If you want access to these reports please call us on 02 6542 2300 or email us on muswellbrookcoal@idemitsu.com.au. For all blasting operations, overpressure and ground vibration is measured and recorded. Muswellbrook Coal provides a telephone complaints line for the purpose of receiving any complaints from members of the public in relation to activities conducted at the premises or by the vehicles or mobile plant. A register of all complaints is maintained, and includes information relating to the nature of the complaint and actions taken by Muswellbrook Coal Company.